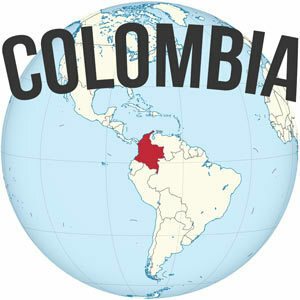 Cali, Colombia is famous throughout the country, if not the world, as a hot spot for salsa music and dancing. 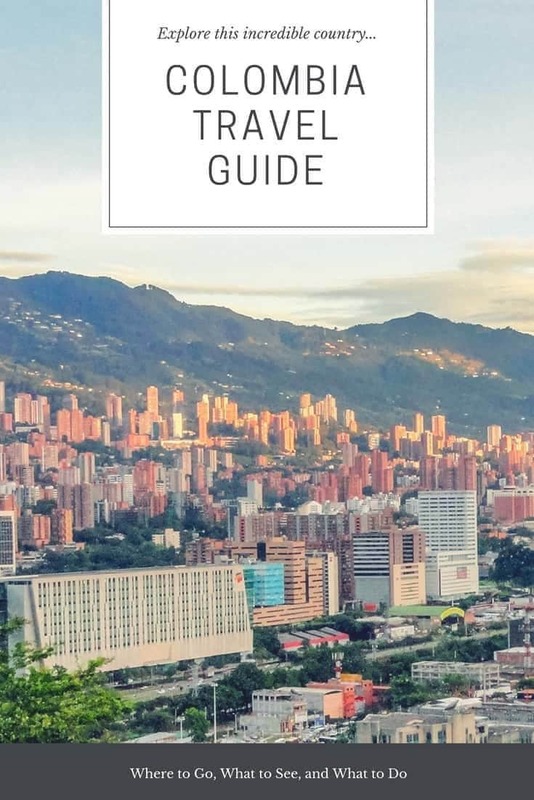 One of the first things you’ll notice upon arrival though is that Cali is just plain hot, but if you can brave the heat, you’ll find that there are plenty of awesome things to do in Cali Colombia. The heat and humidity may feel like a wet blanket, taking you back to the tropical coast, although the ocean is still very far away. 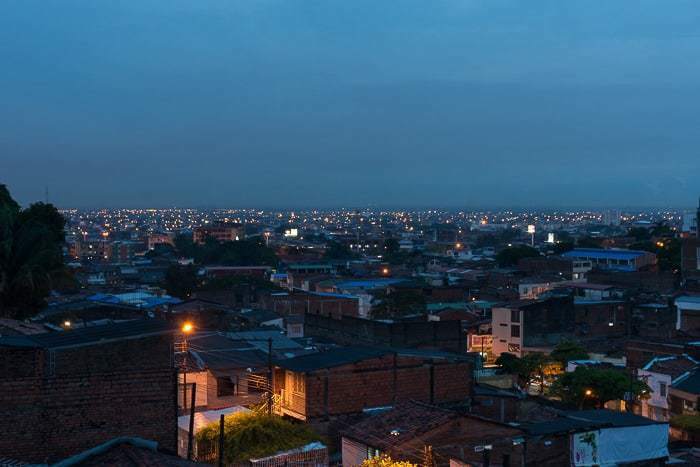 Cali is Colombia’s third biggest city, a cultural mixing pot where you’ll find faces of every color. 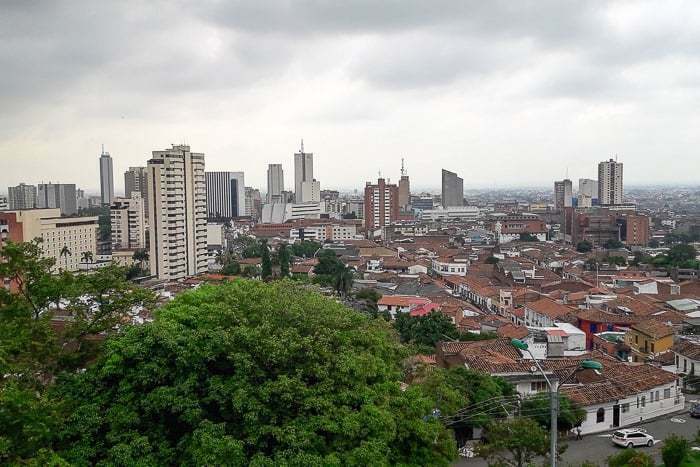 Cali Colombia has a bit of a bad reputation, a place that has been plagued by drug violence and insecurity, and while you should always be vigilant in any big city of Latin America, I didn’t find Cali to be overly worrisome. 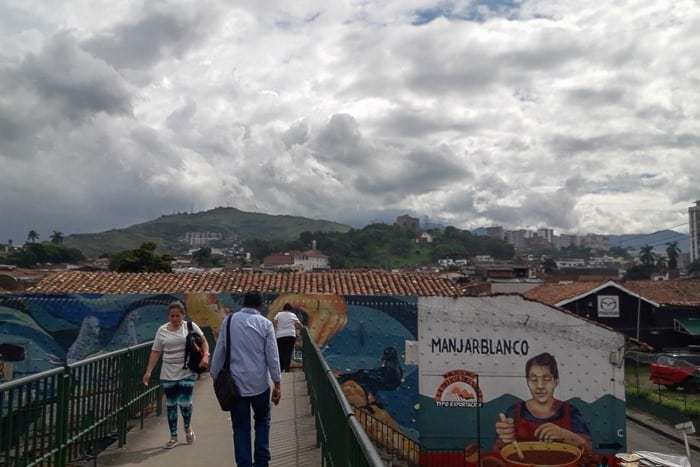 Indeed, it felt much like Bogota or Medellin in terms of the general atmosphere. 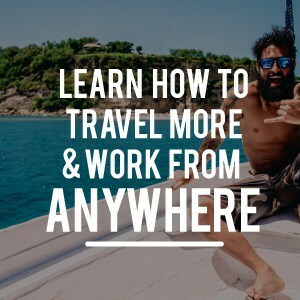 For the average tourist there isn’t a ton of things to do in Cali unless it’s a place you are looking to settle down for a while to work on Spanish or learn salsa. But there are a number of highlights that are worth checking out if you’re staying in Cali for a night or two. 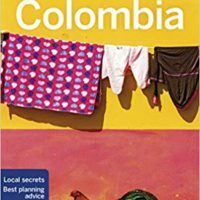 So, if you’re wondering what to do in Cali Colombia, here are my recommendations after visiting a few times. 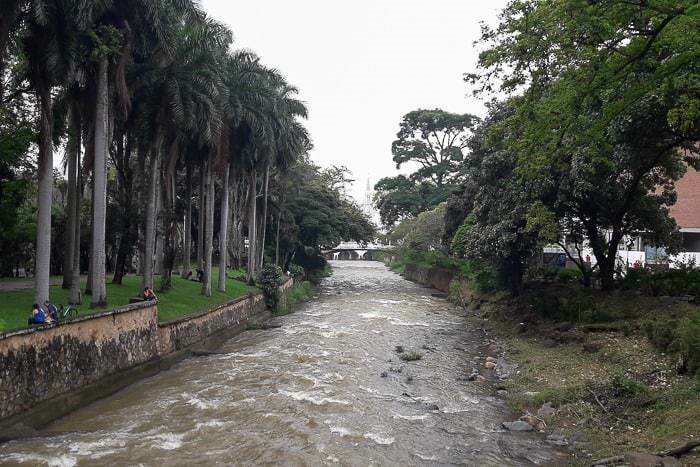 The Rio Cali runs along the north end of downtown — on the other side of which lies the Zona Rosa, an upscale area. The area along the riverfront has been converted into a long stretch of park where you’ll find bicycle lanes, pedestrian friendly walking, ample places to sit in the shade, and some art and statues. It’s a very lovely and agreeable area to relax and take in the sights and sounds of Cali. Main public buildings, like the mayor’s office and administrative headquarters sit just beyond the park’s edges, and lend to the open and car-free spaces. In the park, you’ll find people selling cold drinks, ice cream, luladas, cholados, and raspados to beat the heat (more on that in a minute). 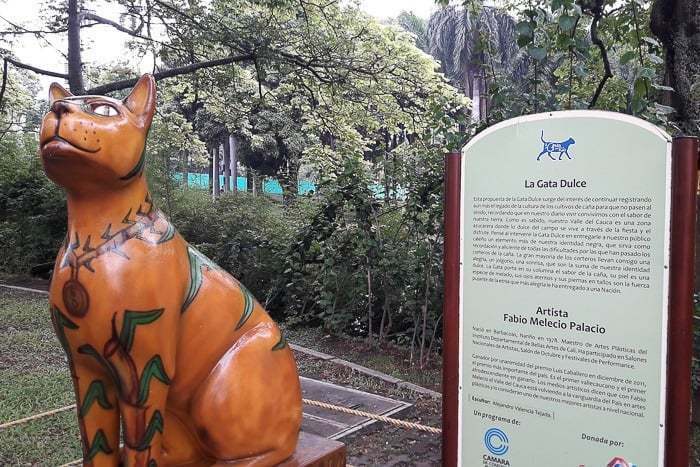 Further up the river, along the park, you will find El Gato del Rio, a famous sculpture by the Colombian artist Hernando Tejada. After his passing, a number of other painted cat sculptures came to the park by other artists in homage to him. It was all an effort to beautify the area. Cali is famous for a number of these cool and refreshing drinks or desserts, and you’ll see them sold from street cars and little stores all over the city. Cholados are decadent fruit and ice cream mixed together, a sticky sweet mess that you’ve got to eat before the heat tops it off. Raspodos are basically like shaved ice you may already know and love, topped with your favorite flavor or something new and exotic. Be sure to try and taste all three! 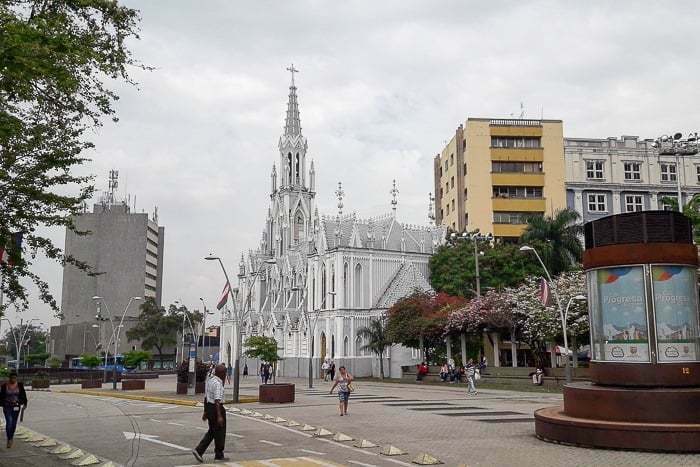 Along the far edge of the park you will see the opulent little chapel known as La Ermita, with it’s bright color and white trim, it commands attention from all throughout the park. The church is beautiful, but it’s actually quite small. After all, it is just a chapel. The architecture in the downtown area surrounding the park and chapel are equally impressive. Old colonial structures that harken back to old times and feel a bit like something out of Cartagena, albeit on a smaller scale. If you’re feeling like burning a few calories, then a hike up to the top of either Cerro de los Cristales or Cerro de Las Tres Cruces may be in order. 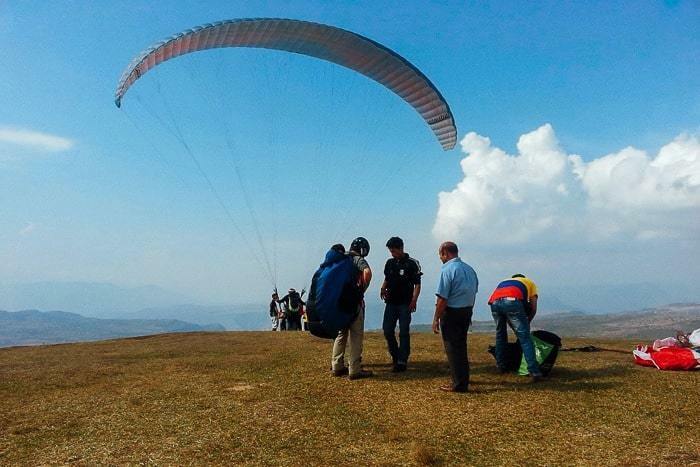 Either hill stands more than 1,000 feet (400m) above the valley floor and offers an incredible vista of the sprawling city below. At the top of Cerro Cristales you will find a 26m tall statue of Jesus Christ with his arms outstretched — just like the more famous statue in Rio de Janeiro, but a bit smaller. The top of Cerro de Las Tres Cruces has, surprise, three crosses at the top. Either hike is free, but you would be best to do the hike in the morning before it gets too hot, and Sunday is a particularly good day since it brings about a crowd of locals, making either hike more safe to undertake. 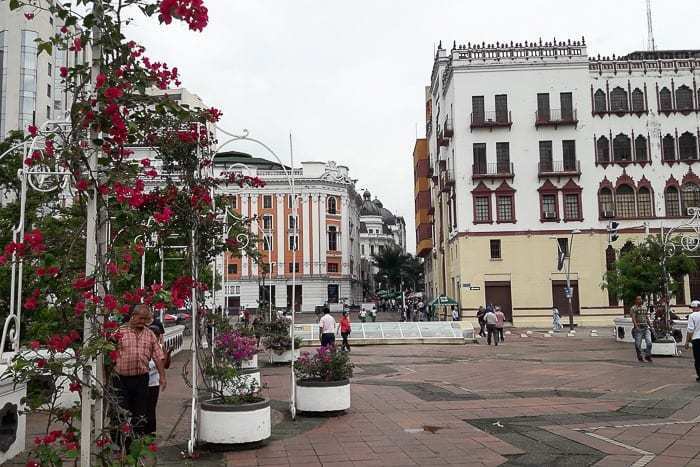 From the Rio Cali, if you veer south and then west across the downtown core, you will come to Calle 5, a major thoroughfare. Just on the other side of the pedestrian bridge lies the neighborhood of San Antonio, one of my favorite parts of Cali. Here you will find the old city, with its narrow streets and intricately designed buildings. It’s nice to just walk around and take in the atmosphere, but the neighborhood is full of cool hidden gems as well. It’s a place full of theaters, artsy restaurants and cafes, and artisan goods. It isn’t one of those neighborhoods that is full of kitschy tourist trinkets, but just a bohemian, artsy place where locals (and backpackers) go. These are my favorite types of neighborhoods anywhere in the world, to be honest, and San Antonio is a pretty great and unexpected one. Just above the neighborhood of San Antonio, off to the west, lies the San Antonio Church, sitting proudly atop a small hill. The church itself is nothing spectacular to see, it’s not ornate, and it’s even smaller than La Ermita, but the view from the hillside is one of the best and most accessible in Cali. You can see the sheer size of the valley stretching out below and the towers rising from the downtown corridor. 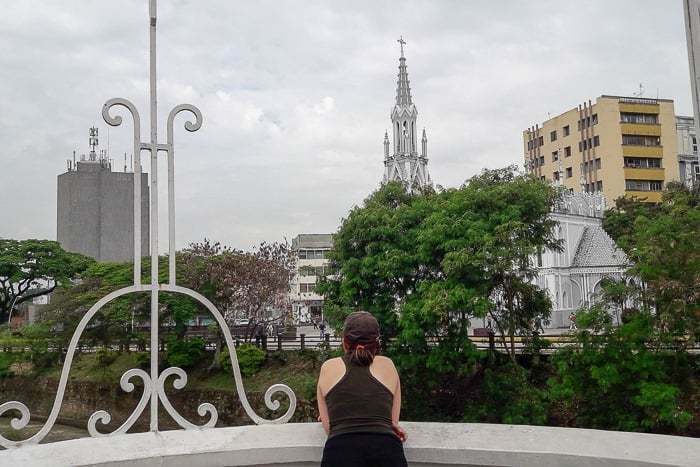 It’s a great place to get an overview of the city, and a stop either before or after exploring the neighborhood below. Chocolate was one of those cool little artsy restaurants we just stumbled into while wandering through San Antonio and looking for lunch. Inside the place is full of art, the walls are decorated with old vinyl, and the host was friendly and warm. They offer up breakfast, brunch, and lunch, but we went for lunch. The place was full of mostly locals, and the host seemed to know and welcome everybody as regulars. 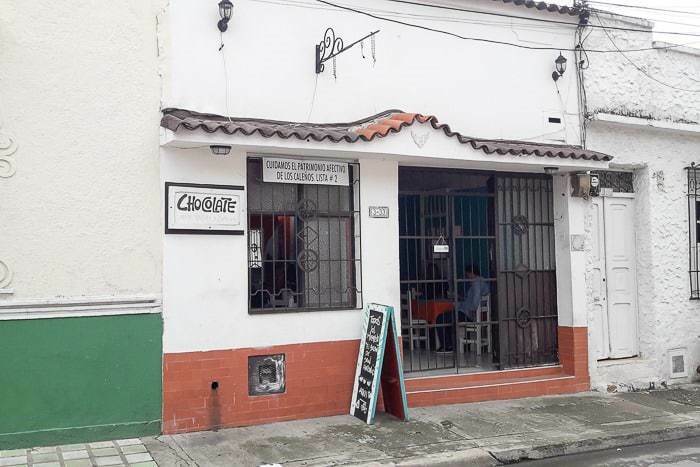 Each day features a fixed menu of the day for lunch, and we happened to go there for Ajiaco — basically a Colombian chicken soup that is a specialty of Bogota. Both Andrea and I found it to be delicious and authentic. Best of all the hearty meal was only 8.000 pesos (less than $3) — super cheap. Each Wednesday, Chocolate along with other area businesses hosts a flea market. The host implored us to come, but our travels would lead us out of Cali before the next Wednesday. Pandebono is a cheesy bread that you can find throughout much of Colombia, but which originated here in Cali. I love a good pandebono, so if you’re looking to try the original and the best, you can’t miss out eating it here in Cali. Pandebono is a simple but delicious bread, most often eaten for breakfast. It may have gotten its name from an Italian cooking “pan de buono” aka good bread. In every new city I visit, I try to find the coolest cafe with the best coffee. Macondo in San Antonio didn’t disappoint. 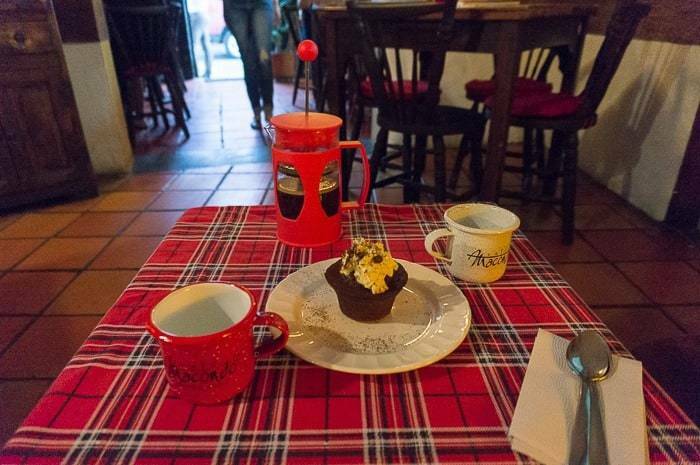 It’s another little hole in the wall, near Chocolate, with cozy seating, a dim interior, and walls full of interesting art. My key to finding a good coffee shop is someone that serves up black coffee prepared at the table with Chemex, Aeropress, or at least French Press, and serves up a few a few different beans to choose from. We ended up getting two servings of French press and trying both beans on offer that day, one from Cauca and the other from Huila. Both were good, but I preferred the brew from Cauca. In case you didn’t catch it, the name Macondo is a reference to Gabriel Garcia Marquez, Colombia’s most revered author. Champus, like shampoos? It’s pronounced like that, but no, it isn’t for washing your hair. Champus are a unique fruit drink served in southern Colombia (along with Ecuador and Peru) that consists of a corn flour base mixed with fresh fruit chunks, cinnamon, and other spices. The name sounds uninviting, but the drink is really good! Not only is it refreshing but it will fill you up with the whole fruit chunks. You can find champu stalls throughout the city. 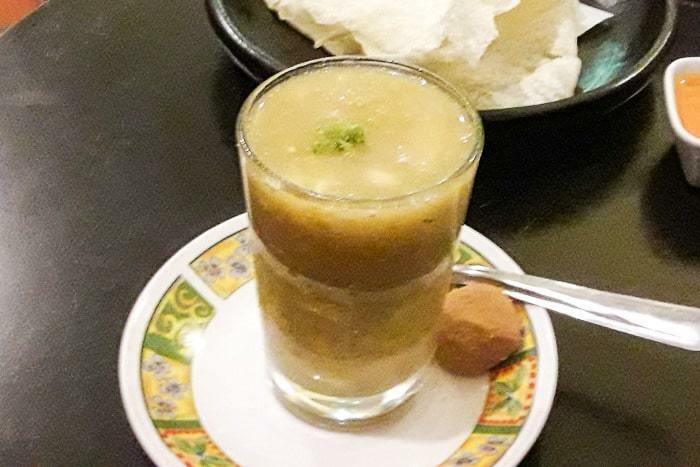 Dance Salsa – I can hear you saying, where’s the salsa recommendation in this capital of salsa? Well, we didn’t go dancing. 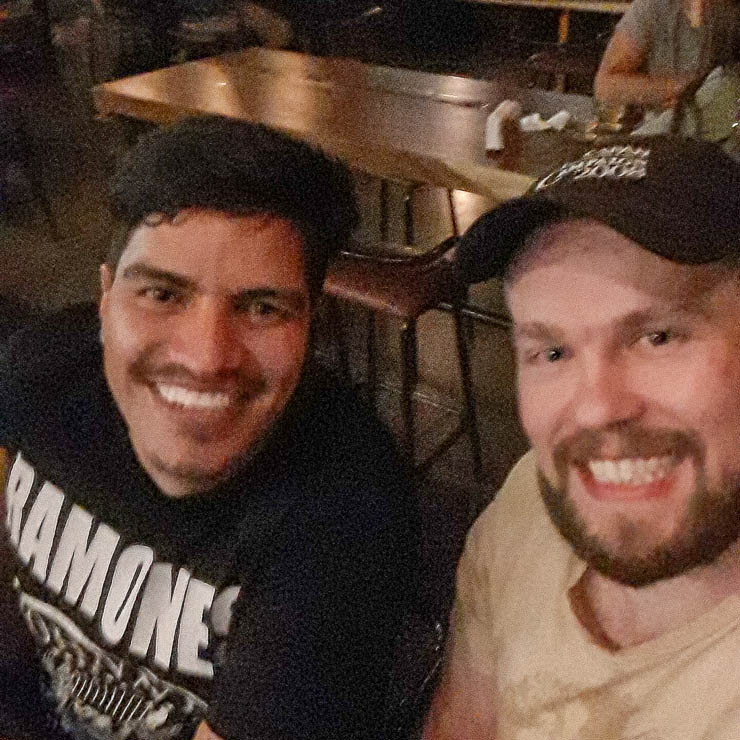 It was early in the week on our last visit, and the hot weather doesn’t really provoke me to go to a hot and sweaty salsa club. 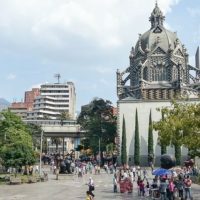 I can give you some recommendations on the best places in Medellin, but here’s an article on salsa in Cali. The Zoo – The Cali zoo is reported to be the best in all of Colombia, featuring animals that you won’t see anywhere else in the country, including some fairly exotic creatures. The entrance is about 15.000 per person, $5. 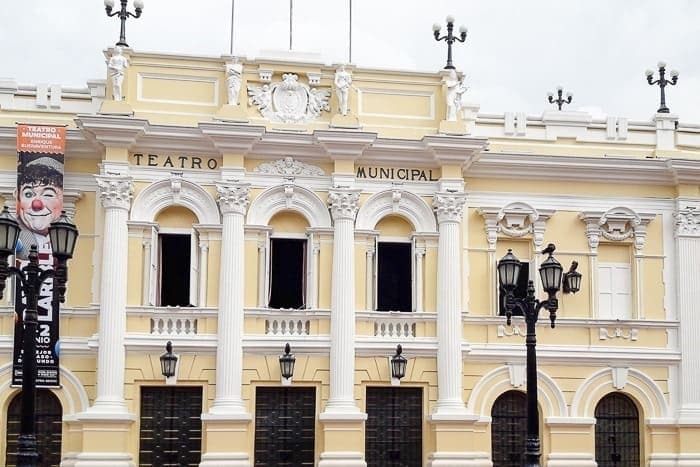 Tertulia Museum – A popular cultural and artistic hub within the city of Santiago de Cali. Here you can find art exhibits, movie nights, lectures, and a host of other activities, so be sure to check out what’s coming up during your visit. 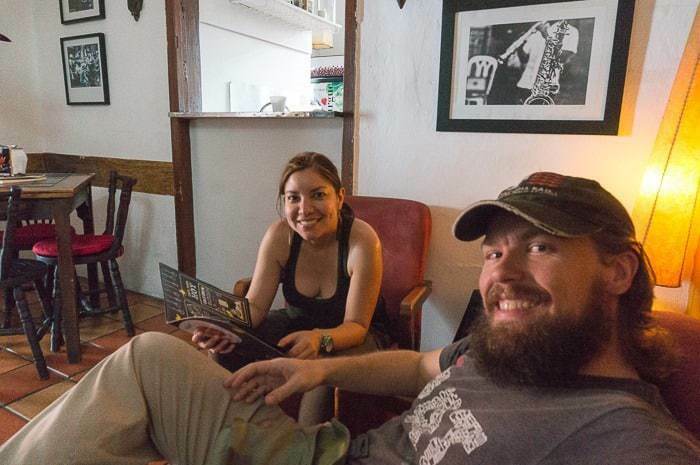 If you’re coming in for a short visit and doing some of these Cali sightseeing activities above, then I would recommend looking for an Airbnb or hostel around the Zona Rosa or around San Antonio. I’ve stayed in both neighborhoods on two separate visits, and I think I’d give the edge to San Antonio if you aren’t focused on nightlife. San Antonio is the more interesting, eclectic, and entertaining part of Cali, in my opinion. 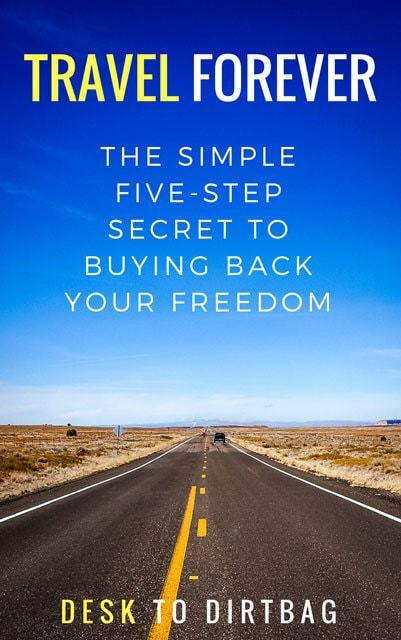 Traveling to Cali on your next trip? 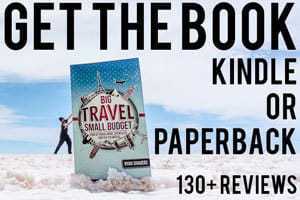 Book the perfect room on Booking.com today! 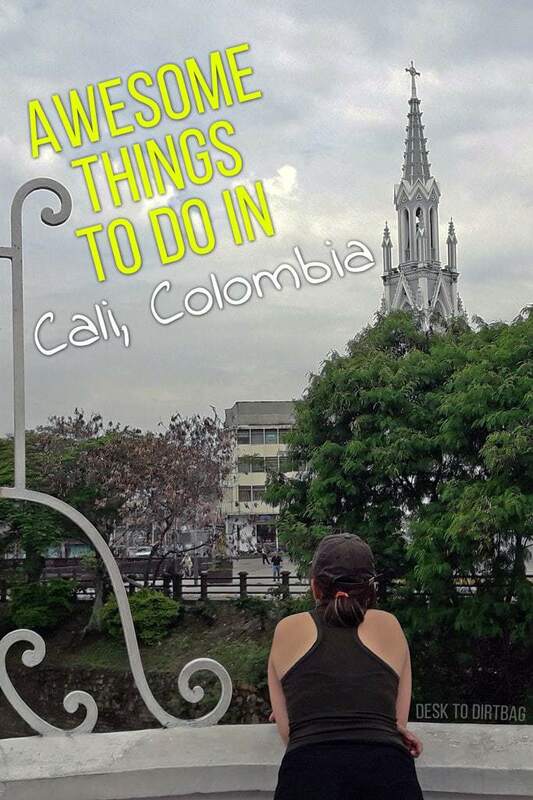 Did you enjoy this post about things to do in Cali Colombia? Please take a moment to share it on Facebook, Pinterest, or Twitter.